If you need to improve your current financial situation, it is possible to make little changes to your spending habits and improve your finances, today. Don’t put off what you can do today, it will help your finances and this is important. You will work hard for your money and you must take the steps needed to ensure that it is working as hard as it can for you. It doesn’t matter what your current financial situation is, there is always room for improvement and ways to help improve upon your current financial position. There are different actions which you can take to help improve your financial situation today. 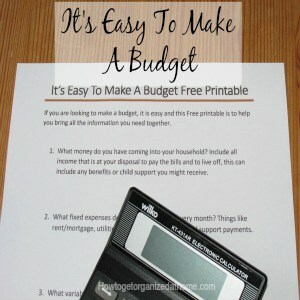 Create a budget; it is the most important thing you can do with your finances. It will help you identify where your money is going and if there are any ways in which you can make savings and adjustments. Creating a budget is the only way you can really see what money you have coming in and the money that you have going out every month. Avoid credit if possible. I know that you need credit to have a great credit rating. However, credit is too easily obtained and this can have a negative impact on your current financial situation. Taking out more credit when you are unsure about your current financial situation isn’t the best option, understand where you are financially and only then consider your options carefully. Paying bills on time is the most important action you can take to improve your credit rating. Late and missed payments do more damage to your credit and future interest rates than anything else you do. It is so important to pay your bills on time. I think the most important thing you can do to improve your finances is to use cash. It is too easy to pay for goods and services with your credit or debit card. It takes more thought over the purchases you make and the money you have if you use cash to pay for goods and services. Be accountable for the debt that you currently have. It is too easy to deny how much money that you owe, knowing the full amount of your current debt is an important step to making plans to reduce the amount which you owe to credit companies and saving you money each month in interest payments. Look at your current spending; sometimes this can highlight payments to companies that you no longer need to make. It is easy to set up direct payments to companies and this reduces the chances of missing a payment and incurring charges that only add to the debt that you already have. Being aware of the interest rate that you are paying. Knowing when the interest rate is too high and the effect that it will have on your finances and the money you have available to spend will enable you to make better financial choices in the future. I am a list maker and I feel this is the most important task that you must undertake. You must make a list before you go shopping, this tells you what you need and you don’t buy items that you already have. If you pair this with a calculator and add up what you are putting into your trolley you will have a better idea of the total cost of the goods and you can make adjustments to make sure you have enough cash available. Know your budget and your limits. It is important that you are able to say ‘no’; this is important when you know you haven’t the money for an item and you are able to stop before you spend money that you haven’t allocated for in your budget. It is difficult to say no to your children or to peer pressure; I know, I have had to face both and it is hard for others to understand that you can’t afford something when credit is so easy. But if you want a better financial future it is important that you do say ‘no’ when your budget doesn’t allow for the expense. A great idea that is gaining popularity is to go on a spending freeze. The idea is that you only spend money on the essentials, like the bills that you have to pay. But for other items like groceries, you try to eat out of your freezer and store cupboard, reducing the money that you normally spend on food and treats. The more notice you take over your financial situation the better understanding you will have of your current financial situation. The more that you are aware of, the better understanding you will have and are able to make financial decisions which are better for you. Setting financial goals for your future is a great way to look at what you want from life. By having goals and a clear understanding of your financial picture will help you reach your goals. The more you understand about your money, the harder you can make it work for you. After all, you work hard for your money, you might as well make the best of the situation and have the control of where it needs to go every month. If you are looking for more advice on budgeting, I love the author of this book he makes so much sense when it comes to money. What is your best tip to improve your finances? Therefore, if you are looking to improve your finances you can do something today that will help and could even improve your financial position long-term. What is important to remember is sticking to your plan and taking the action you need to improve and understand where you currently are in your overall financial picture. Looking for more articles on this topic? Head over to the landing page where you will find links to other articles on budgeting. I wrote another article I think you will like, It’s Easy To Make A Budget.